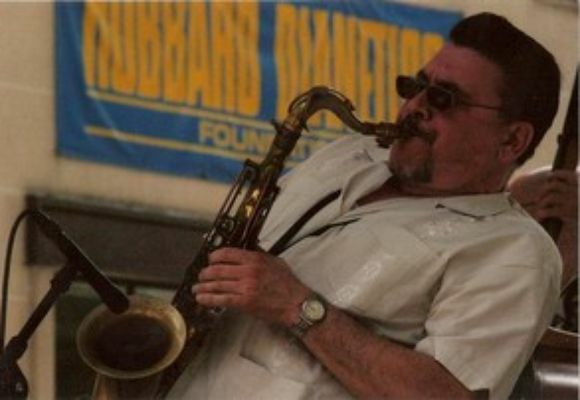 "A thoughtful soloist whose subtle swing has plenty of fiber" is how Ira Gitler described tenor saxophonist Jerry Weldon in The Biographical Encyclopedia of Jazz. A native New Yorker, the tenorman is a veteran of the New York Jazz Scene, his résumé reading like a virtual "Who's Who of Jazz." After graduating from the Rutgers University Jazz Program under the direction of Paul Jeffrey in 1981, Jerry joined the legendary Lionel Hampton Orchestra, touring extensively in the U.S., Europe, South America, and Japan. Jerry continued his association as one of Hamp's favorite tenor soloists through the '90s and into the new millennium. Next came a long and rewarding tour of duty as a member of master organist Jack McDuff & his "Heatin' System," resulting in many fine recordings on the Concord label. In 1990, Jerry became a charter member and featured soloist with Harry Connick Jr.'s newly formed Big Band. Jerry has toured the U.S., Europe, Asia, Australia and has also performed on many television shows worldwide with the Connick Orchestra. In 2001, Jerry was also part of Connick's Broadway musical production, "Thou Shalt Not" where he appeared on stage as well as in the orchestra. The '90s also found Jerry in another long and fruitful musical cooperative- the New York Hard Bop Quintet, along with trumpeter Joe Magnarelli, pianist Keith Saunders, bassist Bim Strasberg and drummer Clifford Barbaro, the unit toured throughout the U.S. & Europe while recording four stellar albums for the Swiss TCB label. Jer has worked and recorded with organists Jimmy McGriff, Joey DeFrancesco, Bobby Forrester, Dr. Lonnie Smith, and Mel Rhyne, trombone great Al Grey, piano giants George Cables and Cedar Walton, drum legends Roy Haynes and Jimmy Cobb as well as guitarist/singer George Benson, guitarist Earl Klugh, bassist Keter Betts and singer Mel Tormé. In 2003 Jerry was involved in a very special musical project: "Jazz @ Lincoln Center Plays the Music of Dexter Gordon". Along with fellow tenorists Jimmy Greene and Wayne Escoffery and the George Cables Trio, the sextet performed at New York's Kaplan Penthouse and also toured the U.S. "That was really special to me" Jer said, "Dexter was one of my very favorite musicians. I was thrilled and honored to have been a part of it." Weldon is a bandleader in his own right, leading ensembles at many of New York's jazz clubs and at jazz festivals around the U.S. He has recorded several albums under his own name, among them, "Head To Head," a swinging two-tenor date with Michael Karn on the Criss Cross Jazz label "Midtown Blues," a rousing quintet with long time collaborator Joe Mags (Magnarelli) recorded live at Fat Tuesdays in NYC, and two hard-swinging dates with the late, great organist, Jerry's long-time pal, Bobby Forrester. "It was after working with Bobby all those years that made it easier to the go with Jack (McDuff), Jimmy (McGriff) and all the other cats" says Jer, "Bobby was truly a hero of mine." Jer continues to be extremely active on the New York scene- "I just want to keep it swinging. If I can do that, I'm happy."